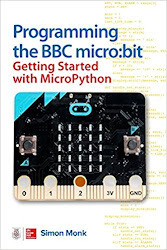 We were all planning what we could do to hack some electronics with our Raspberry Pi's even before they arrived, and a little help in accessing and using those pins on the GPIO connector makes life a bit easier. In this review, I look at the relative merits of three prototyping boards for the Rasspberry Pi. I use the term 'Prototyping' to distinguish them from expansion boards like the Gertboard and Pi Face that have buffers, level converters LEDs and other electronics attached to them. What I am talking about here is the Raspberry Pi equivalents to the Arduino ProtoShield. I.e. something that we can solder our own electronics to, in order to make something. Oh the awful puns - thank you Raspberry Pi Foundation! Prices are an indication only at the time of writing. Check the websites. Be aware that all these products come as kits that must be soldered together. But then you are going to have more soldering to do anyway, to make your project, so no problem! I first used a Slice of Pi, that I bought on eBay, in the LED blinking project that I posted about here, and then later when trying out Ciseco's XRF wireless sensors with the Raspberry Pi here. The first thing about the Slice of Pi is its cost. If you just have a little bit of electronics that you want to attach to your Pi, then there is enough space on the board to put in a DIL IC and a few extra components, which will probably do just fine for most projects. The second thing that I like is the X-Bee format headers connected to the Pi's serial pins. This means that you can plug in all sorts of X-Bee format RF links. But, you don't have to, leave the sockets off for a bit more room on the prototyping area. The connections are just simple socket headers, no fancy screw terminals, but again that is just fine in many cases, and sometimes you will not even need to fit them and just solder everything up on the board itself. At the time of writing (Aug 26, 2012) the Humbe Pi is only available for pre-order. Thanks to Ciseco for sending me one to play with. The Humble Pi is the Slice of Pi's big brother. Again it fits over the Pi, this time covering almost the whole footprint of the raspberry Pi, with a cut-out around the RCA video connector. Unlike the Slice of Pi, there are no header sockets. It is designed for you to built your whole project on the board. So, pretty much the whole of the board is taken up by a huge prototyping area. The really nice touch is that the designer has placed pads in one corner for you to add your own 7805 compatible voltage regulator, 2.1mm DC power socket and associated capacitors. This means that you can potentially power the whole Raspberry Pi from a regular DC power supply of say 7 to 12V. Less with a LDO voltage regulator. Its a very useful board, that has been well thought out. 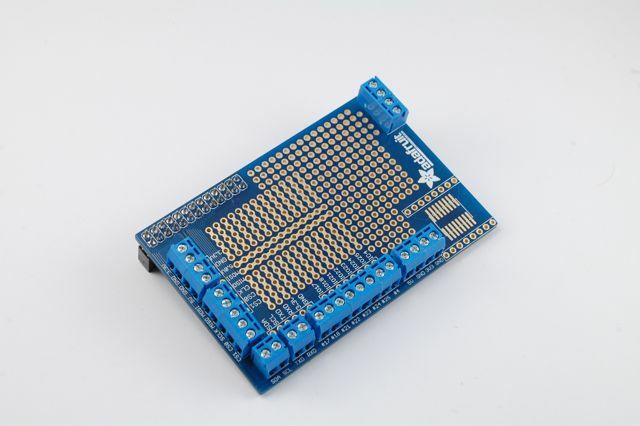 The Pi Plate is the Rolls-Royce of Pi prototyping boards. It covers an even bigger area than the Humble Pi, by using an extra-tall header socket removing the need for a cut-out area. It is exactly the same size as the whole Raspberry Pi. The board contacts are gold-plated and screw terminals are provided around the edge of the board that break-out the GPIO pins. If you prefer header sockets to screw terminals, then two connectors of 6 and 8 sockets are also catered for on the board. The first row of connections for the serial and I2C busses, the second for GPIO pins. Nice touch! One corner of the board has a breakout area where a SOIC (surface mount chip) can be soldered. 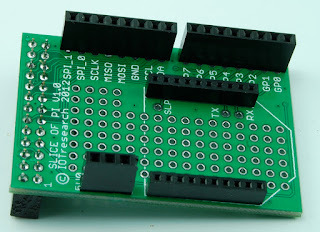 Something that has carried over from some Arduino Proto Shields and is very useful on occasion, for those chips that are just not available as through-hole. There is no dedicated area for a voltage regulator. 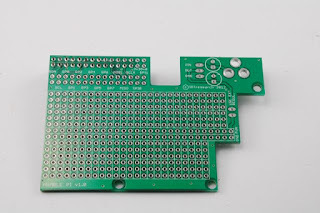 However, four of the screw terminals (top right) are not allocated to any Raspberry Pi GPIO connections, so it would be quite simple to use two for DC power-in and place the voltage regulator and capacitors on the general prototyping area. As with all Adafruit products, the quality is high and the website contains good documentation. There is no one board that you should always buy. It depends very much what you are trying to build. If it is a small project and the electronics will fit on a Slice of Pi, use that. If the project is too big for a slice of Pi and you are going to fit everything on the board and do not need screw terminals, then use the Humple Pi. However, if the screw terminals would be useful, or you want a general purpose board to experiment with, then the Pi Plate is the best choice. I fully expect to make good use of all three boards. Not exactly a prototype board for RPi but I made an open-source extension board for the RaspberryPi called RasPiComm, featuring a RTC, RS-485, RS-232, inputs and outputs. I fully agree that Humble Pi is a very useful board -- and a very affordable one, too. Careful though, the pads for the voltage regulator are for an LD1117. This is important, because the pin layout is different. The 7805 has IN, GND, OUT whereas the LD1117 has GND, OUT, IN.